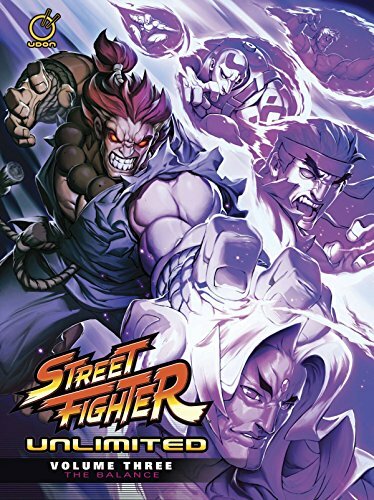 This 128-page hardcover collects issues #9-12 of Street FIghter Unlimited comic series. There's plenty of action in this volume with Gill revealing the secrets of the Secret Society. What looks like a straight up fight with Ryu and Gill turns into a royal rumble after Ryu goes into Satsui no Hado evil Ryu mode. Then many of the classic SF characters joined the fight before we have the Ryu coming back to senses, and then faces off with Akuma in the last fight. This is the classic SF comic book with plenty of fight scenes that SF fans will like. It made me want to go to Youtube to watch some SF video game fights too. LOL. Last few pages of the book has short stories that features other SF characters. The stories are a bit too short to be satisfying. And the artworks aren't as exciting as the earlier pages drawn by Joe Ng.